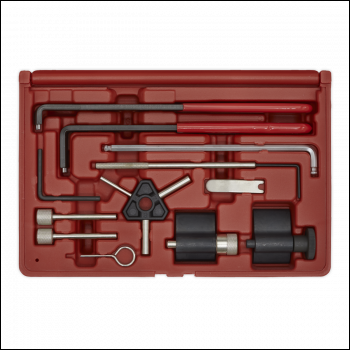 Comprehensive kit covering engine timing and belt replacement on VAG 1.2-2.0D Pumpe Duse and 1.2, 1.6, 2.0D common rail diesels. Also covers these engines fitted in Ford, Dodge and Mitsubishi models. 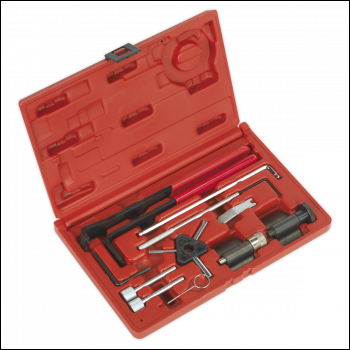 Kit contains crankshaft locking tools for both oval and round crank gears, camshaft locking pins and tensioner adjustment tools. Supplied in storage case. 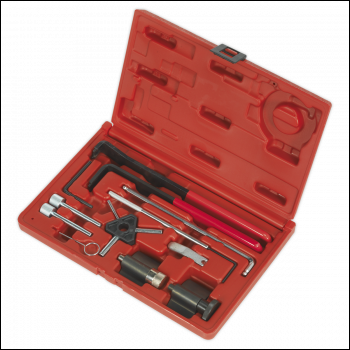 Comprehensive kit covering engine timing and belt replacement on VAG 1.2-2.0D Pumpe Duse and 1.2, 1.6, 2.0D Common Rail diesels.